Made coconut flour keto ‘naan’, out of curiosity. It’s not naan, but it’s good! I have recently started the keto diet after reading this this perfect keto review. A little odd, and definitely soft — you have to be careful flipping it, or it will tear / mush. The texture isn’t really bread-like — closer to injera, maybe. But I actually kind of love the sweetness of the coconut with a tangy pork curry. 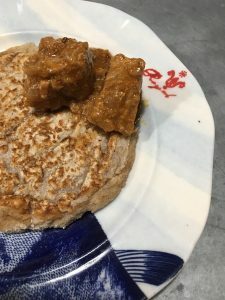 If you’re looking for a gluten-free (or higher-fiber) desi bread-like option, this is a good one; I might even make it again myself.